Vietnam is blessed with a long stretching coastline of over 3000 kilometers from north to south. This geographic characteristic has given Vietnam so many beach paradises which can be found in all three main regions. 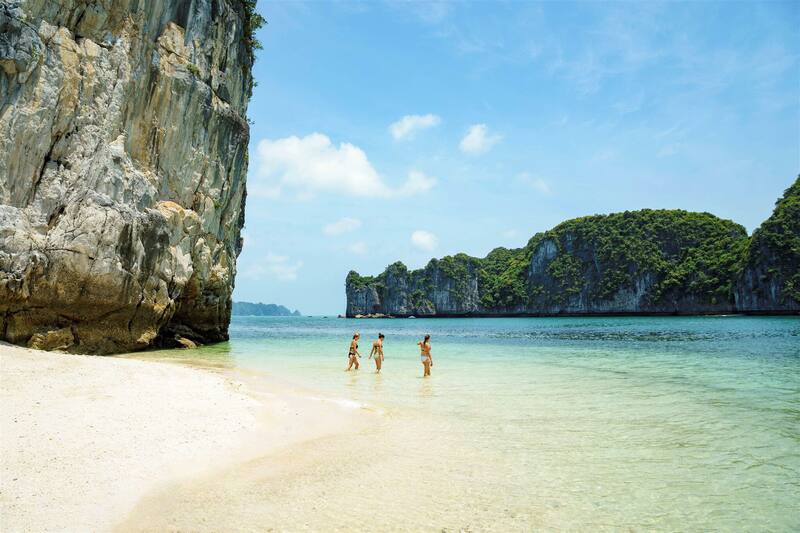 Rivaled to bigger names in Southeast Asia like Bali or Phu Khet, Vietnam beaches are second to no other beach in terms of natural beauty and landscape scenery. 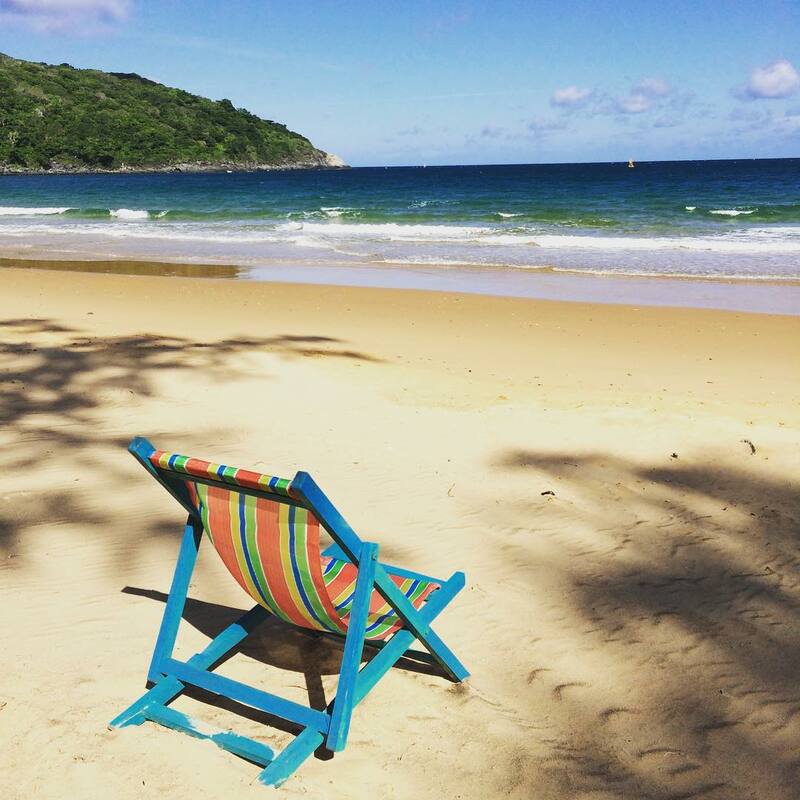 In this article, we'll show you all the choices for best beaches in Vietnam, including major tourist visited beaches and hidden gems you might not know about. 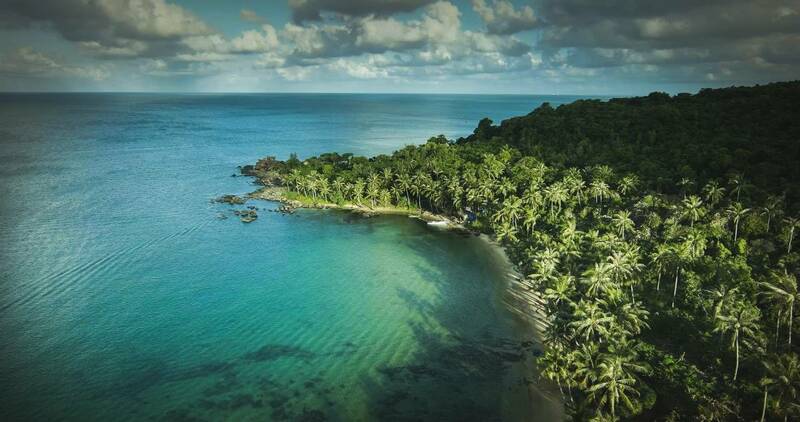 Phu Quoc Island has to its own 3 top beaches of Vietnam, of which Sao Beach or Star Beach is the island’s best beach and presumably also one of the best south Vietnam beaches. Unlike Long Beach, Sao Beach, located on the southern east coast of Phu Quoc island, pleases visitors with the absence of hotels and resorts along the shore. The beach is open for public access and there’re plenty services and beachside activities available. The best time to visit Sao Beach is the summer, between May and October, which is the best time to enjoy swimming since the winds have shifted to the island’s west side. From late October to April, the winds are strong and it’s the best time for kite surfing. Sao Beach is 7 kilometers long with azure water and creamy white sands. You can enjoy snorkeling here to see the colorful coral reefs, schools of small fish and maybe squids. Renting Jet Ski will costs you 450,000VND for 10 minutes and for a giant banana ride, or motor boat – 700,000VND. Khem Beach is another beach of Phu Quoc island that is considered as one of best beaches of Vietnam. Like Sao Beach, Khem beach also has white sandy shore but the sea color is tinted with dreamy greenish colors. The beach is fringed with tall, gracefully swaying palm trees offering cool shades in boiling summer days. Backed by green mountains and coconut forests, natural beauty in Khem Beach is diverse and richer than that of Sao Beach. The shore is crescent shaped, together with powdery sands and green tint, Khem Beach is also known to travelers as ‘Emerald Bay’. Khem Beach has a Phu Quoc cuisine specialty you have to try no matter what: herring salad. You can find this dish at most of the seafood restaurants dotted along the beach. At first, the whole tourism infrastructure in Da Nang was built around My Khe beach. Praised by Americans in the past, My Khe was known as the only destination of city of Da Nang. 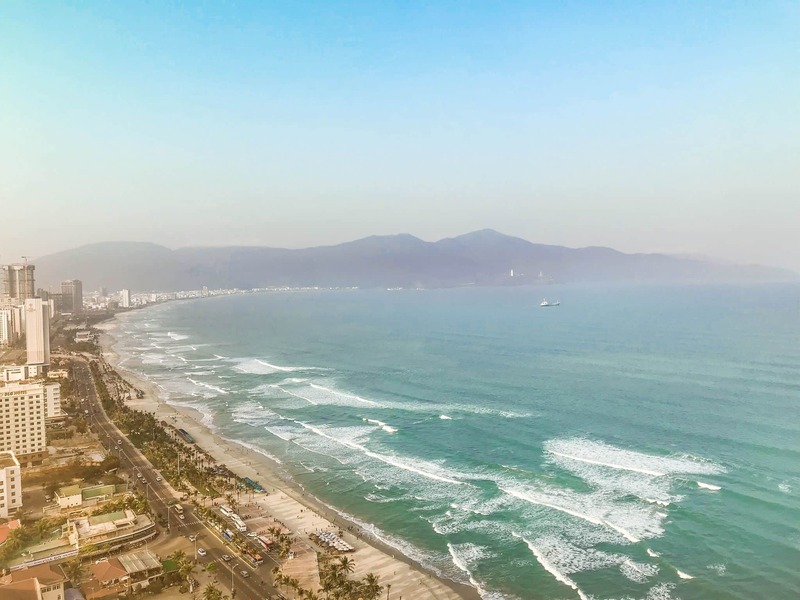 Nowadays, even though Da Nang tourism has developed to be a major tourist destination of Vietnam, My Khe is still the highlight for tourists to enjoy when come to this beautiful coastal city. My Khe beach is blessed with golden powdery sands, palm trees, emerald water. Thanks to its location close to the city centre, a lot of beachside and water activities can be found here. Water games including banana boats, water skiing, wakeboarding, parasailing, jet skiing, windsurfing and kayaking are available. From My Khe, you can easily visit Son Tra peninsula and Linh Ung pagoda. The best time to visit My Khe is between May and October when it’s summertime with clear sky, gentle waves and no storms. Just only 30 kilometers from Da Nang and few kilometers from the ancient town of Hoi An, An Bang beach is a best cooling off spot in your trip to Central Vietnam – the region which has hot weather most of the months of year. Since the famous Cua Dai beach has been suffered from erosion, An Bang took the spotlight. Blessed with soft sands, beautiful sea water color, cool breezes, An Bang is totally a beach paradise where you can enjoy nature, get excited with water gams and socialize with other travelers. The best time to visit An Bang is in summertime which is the dry season in Hoi An. You can expect to have a real good tan at An Bang during these months. When Vietnamese summer holiday starts from June and lasts until August, local people crowd the beach at sunrise and sunset moments. Has been known for its rather romantic beauty, Lang Co Beach is nested at the foot of the most beautiful pass in Vietnam – Hai Van Pass. From the peak of Hai Van Pass, you can easily spot the beautiful landscape of 10km long white sandy beach of Lang Co Bay, fringed with swaying palm trees, lying just off Lang Co town. A special thing about Lang Co is its beach is literally a sand dune of an island-like town which isn’t bound by any mountain. The lagoon water is tinted with a beautiful azure color, exceptionally magical under sunlight. Lang Co is in the close proximity to 3 UNESCO protected heritages: Hoi An Ancient Town, Imperial City Hue and My Son Sanctuary and Bach Ma National Park, making it a perfect beach break in your trip to central Vietnam heritages. With Lang Co town nearby, there are plenty services and accommodation available. If you want to enjoy a private beach in Lang Co, you can stay at Lang Co Resort. 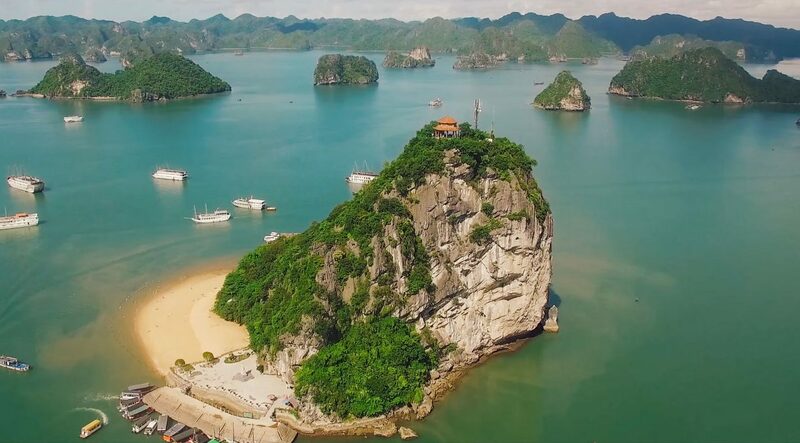 Ti Top island is an excellent viewpoint of the UNESCO protected natural heritage Halong Bay where you can take in the panoramic view of thousands of islands and islets. The island is also known for its beautiful Ti Top beach with incredible white powdery sands, green tinted ocean sea water and top-notch view of the bay. Both island and beach are named after astronaut Ghermann Titov, a hero of the former Soviet Union who came to visit in 1962, accompanied by President Ho Chi Minh. Even before the visit, Ho Chi Minh renamed the island after the name of his special guest. Ti Top is not only the best beach in the Halong Bay, it's a beach where you can start kayaking to explore the bay as well. To reach to the viewpoint, you'll have to climb 400-500 steps to the top of the island. The viewpoint can be crowded at times but be patient, you can get the best pictures of Halong Bay right here. A flight from Ho Chi Minh to Con Dao often takes about 1 hour. When talking about best beaches in South Vietnam, we cannot leave out Dam Trau Beach. Dam Trau has nice yellow sandy beach, gentle waves, nice emerald sea color and an absolute quite atmosphere. Hugged by green cliffs, and fringed by swaying palm trees, the scenery in Dam Trau is just magnificent. There's nothing better than chilling on the beach taking the beauty in front of your eyes without ever being disrupted by other tourism. 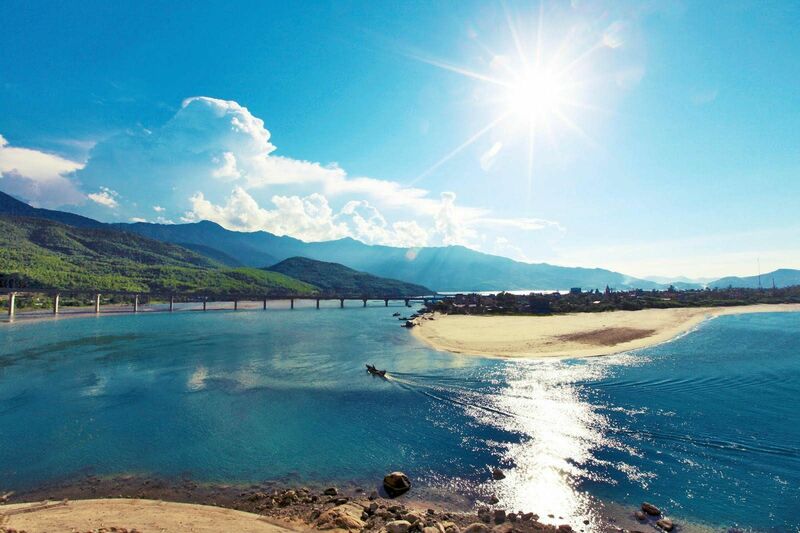 Located down a road just off Con Dao Airport, Dam Trau Beach is fairly easy to visit. There are plenty restaurants around the beach you can enjoy fresh seafood of Con Dao. Fascinated with Maldives? Vietnam has its own walking path between two beaches at Diep Son island, Khanh Hoa province. 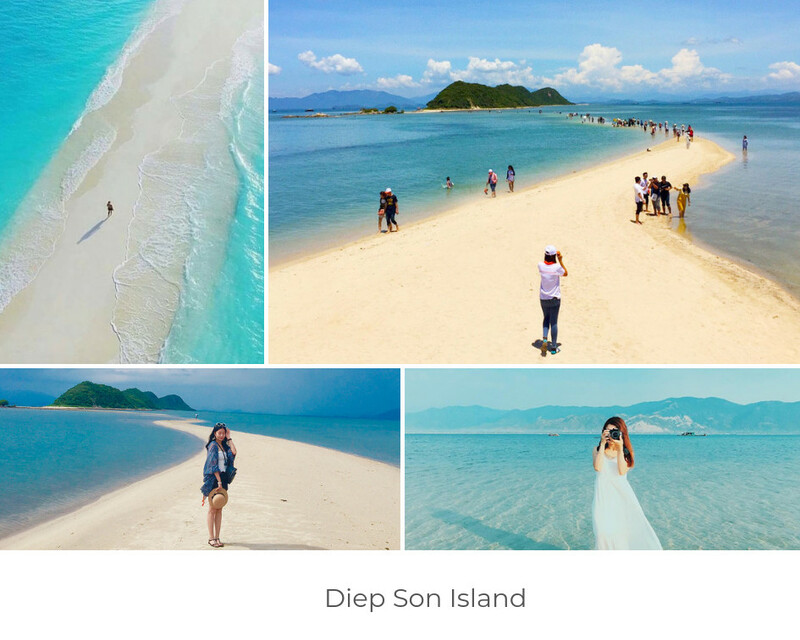 It sounds unbelievable but once you visit Diep Son Island in Van Phong Bay, Khanh Hoa, and walk yourself on the seemingly fragile, winding and pure white sandy path submerged by two crystal clear beaches on each side, your breath will be taken away. The path which is actually a sandbar is only 1 kilometer long, 500m wide and ankle deep. Depending on what time you visit, the path can be entirely submerged or partly visible. Visiting Diep Son, it's a pity to miss visiting the people living on the island, enjoy seafood and discover the pristine and beautiful nature here. The only way to reach Diep Son is a boat trip to Van Gian Wharf which departs when the seats are filled. The trip take you only 20 minutes to reach Diep Son. Best time to visit Diep Son is from December to June which is the dry season. 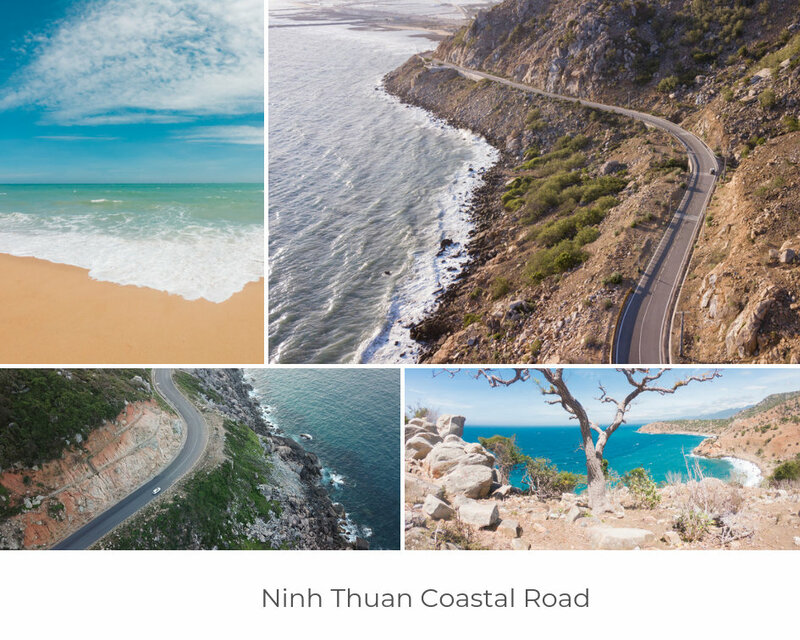 Ninh Thuan is located at the Southern Central Coast of Vietnam, blessed with a hot, windy and sunny weather all year round. 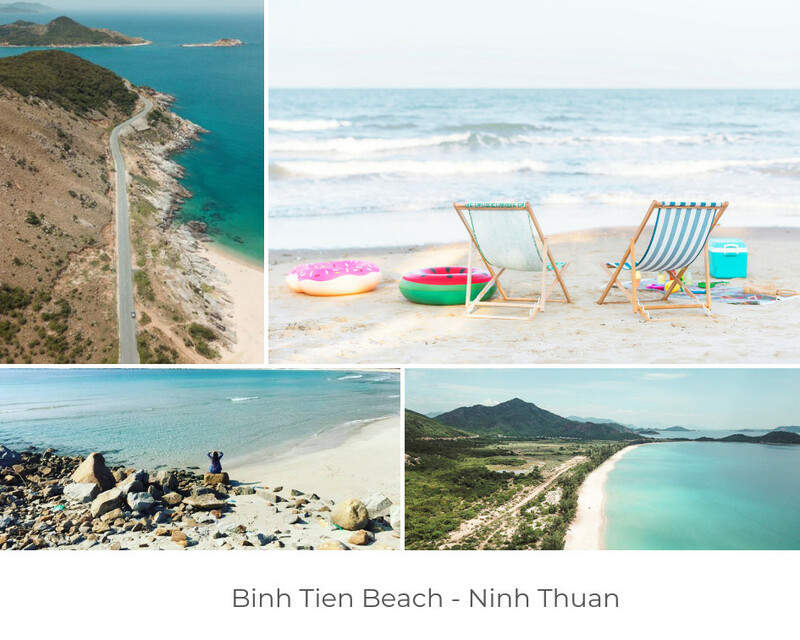 Nature also has given Ninh Thuan beaches and bays with otherworldly beauties. Binh Tien might not be as famous as Vinh Hy Bay or as dramatic as Hang Rai, but Binh Tien cave is no less beautiful as any other beach in Vietnam. First thing to talk about Binh Tien is its pristine beauty which is still untouched by mass tourism. 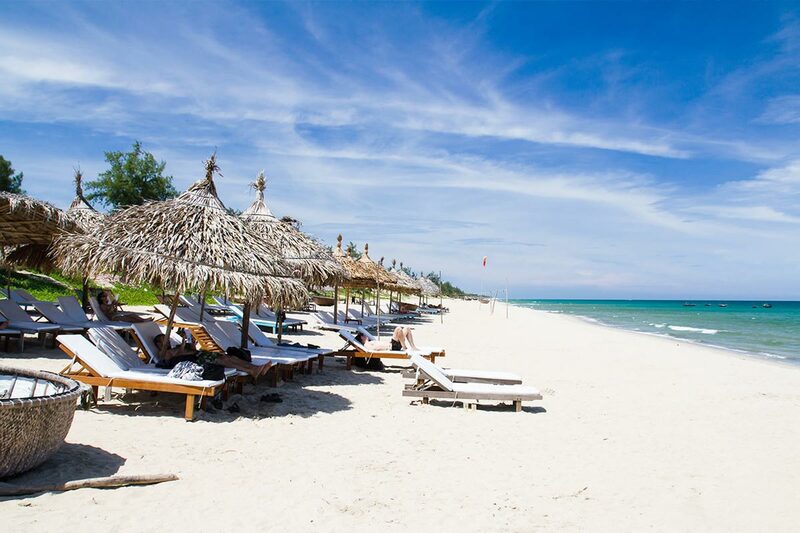 Binh Tien beach is a perfect for those who love to have a whole empty beach to themselves. The next beautiful thing about Binh Tien is the Binh Tien pass. From the magnificent Vinh Hy Bay, following the road, you will get to the pass of Binh Tien which runs in parallel with the white sandy coastline. From the pass, you can see the beach pretty clearly and when you finally reach it, you’ll like the paradise slowly unfolding before of your eyes. Binh Tien beach is also the perfect beach for swimming for its gentle waves, shielded by the mountain cliffs. Snorkeling service is available when you book tour to Binh Tien. Phu Yen has never been considered as a major tourist destination in Vietnam and only until the famous film ‘Yellow Flowers on Green Grass’ hits the big screen, people realize how beautiful Phu Yen really is. Phu Yen doesn’t have dramatic landscape or cultural heritage but its beauty offers a nostalgic return to a Vietnam that now only exists in the memories of old people. The trip to Phu Yen and its beautiful beach is a trip to escape the urban environment. Bai Mon didn’t appear in the film but it’s the must-see place in Phu Yen. Bound by Dien Cape, the beach of Bai Mon is incredible blue and calm while the sands are light yellow and soft. Dien Cape is the easternmost point of Vietnam which means this is the place that has the earliest sunrise in the country. If you have the chance to camp on the beach of Bai Mon, remember to wake up early to enjoy the most magical moment of the day. On the Dien Cape is the 26,5m high lighthouse above the sea level and a sea watch tower where you can take in the panoramic scene of mountain and ocean. There is a small freshwater stream running down from the mountain to the beach, making a great place to wash after swimming in the ocean. 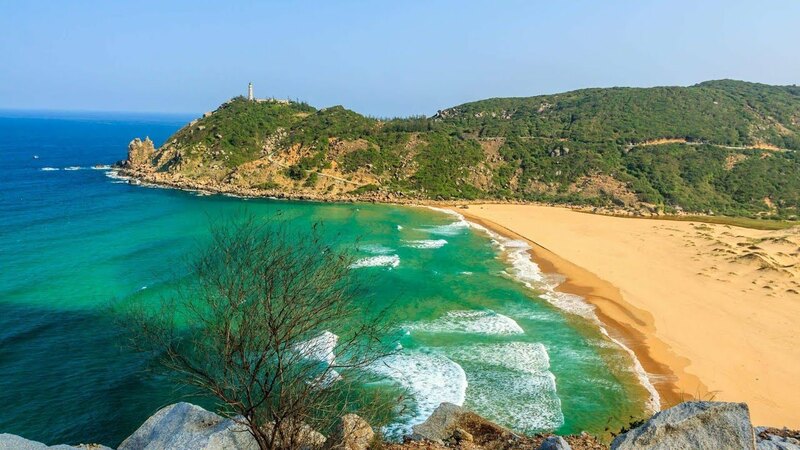 This beach was featured in the famous film we just mentioned above, and in no time, from a totally unknown beach, it become the hottest tourist destination in Phu Yen. Xep beach is located far at the north, about 17 kilometers away from Tuy Hoa City, absolutely untouched by mass tourism. Its appearance on ‘Yellow Flowers on Green Grass’ made us admire a rustic, gentle and calm nature beauty. Xep beach is only 500m long, bound by a long rocky cliff covered in green grass and cactus protruding into the sea. 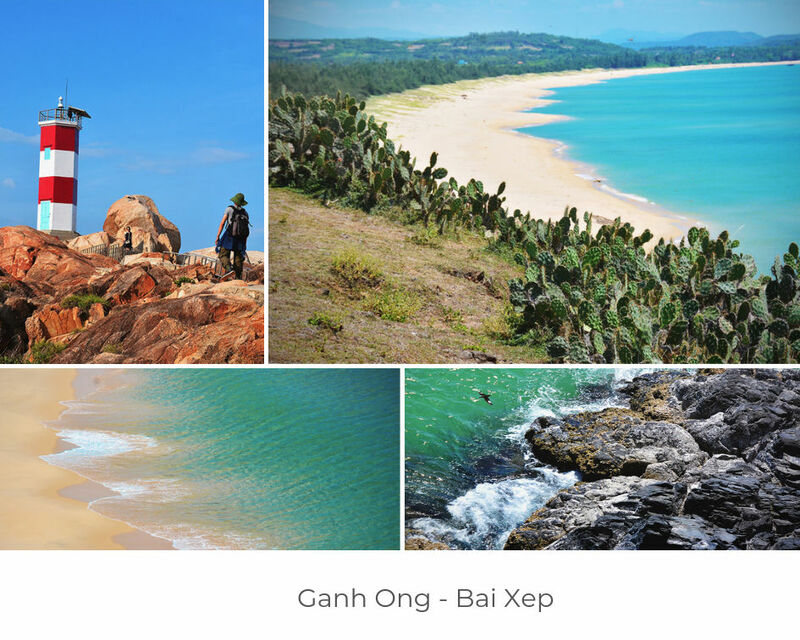 You can also reach Ganh Ong beach from Xep Beach by walking along the coast. Enjoy the cactus, thick casuarina forest and bizarre rock formations of this wonderful beach. Ky Co Beach is a well-known sightseeing in Qui Nhon, Binh Dinh but in general still pretty much a stranger to foreign travelers in Vietnam. 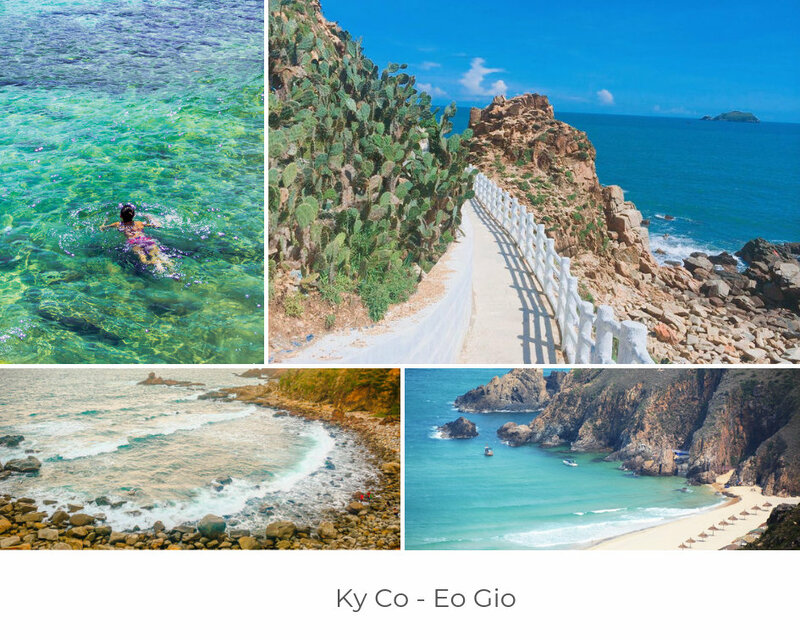 From Qui Nhon, you can reach Ky Co by crossing Thi Nai bridge, further go into the eastern land of the city, you will arrive at a beach paradise with emerald bay, gentle waves and impressive rock setting. Since Ky Co is still not invaded by crowds of tourists, you’ll have amazing relaxing time on one of the most beautiful beaches in Vietnam. Just dive into the crystal clear water or find your way to the clean, hidden ponds formed by the mountain rocks on the right side of the beach, it’s the best experience ever to have in Quy Nhon. You can see in these ponds little fishes and shrimps who couldn’t escape when the water rises. Only 6 kilometers away from Ky Co beach, Eo Gio is another totally different paradise. Eo Gio means ‘The Cape of Winds’ so expect fresh, cool air here. But winds are not the only specialty of Eo Gio, but also most beautiful mountain-coastal paths, crisscrossing on the hillside which we would like to call ‘Paths of the Winds’. A paved coastal path that pass a small blue bay, adorned with an all-white wooden fence. Eo Gio is a fantastic place for picnic and sunset watching. We've shown you all the best beaches in Vietnam, even the lesser visited beaches you might not know about. Talk to our travel experts for more information about Vietnam beaches by sending your request to email booking@asianwaytravel.com. Or get your Vietnam beach tour tailor-made just for you by filling our customize form.